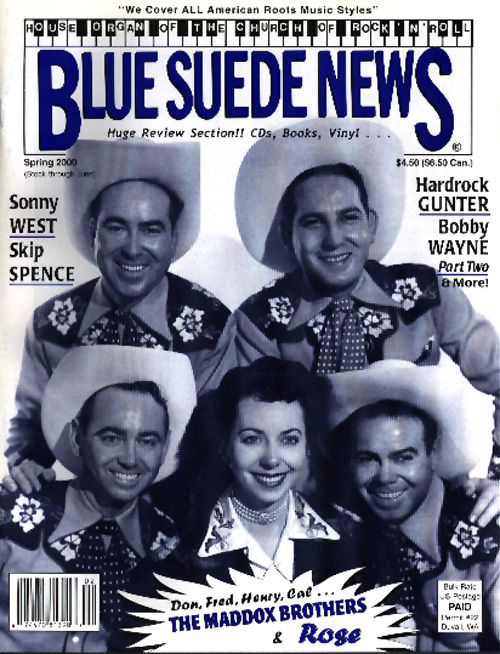 Blue Suede News #50: Maddox Brothers and Rose, Hardrock Gunter, Bobby Wayne, Sonny West, Skip Spence, Moby Grape, the Whiteliners, Rockabilly, REAL Country Music, Blues, '50s Rock'n'Roll! Issue #50 - Spring 2000 - Scroll down to order!! Blues Suede News #50 (spring 2000) has 68 pages with a slick cover. It contains many feature articles including one on the famous hillbilly band The Maddox Brothers and Rose with lots of cool vintage photos showing their colorful western outfits. Don Maddox is interviewed here. There is also an interview with veteran country artist Bobby Wayne who got his start with Rockabilly music in the '50s, putting out country records a la Johnny Cash and great guitar instrumentals in the following decades. He talks about working with Ferlin Husky, Lefty Frizzell and other country and western stars. Texas songwriter and singer Sonny West who wrote "Oh Boy" and "Rave On" for Buddy Holly is interviewed and then there is an article about the Australian alt. Country band the Whiteliners and one on Skip Spence who was with Jefferson Airplane and Moby Grape in the 60s. Rock'n'Roll pioneer Hardrock Gunter is featured with an extensive article about his days with Hank Williams, his use of the term Rock'n'Roll describing the music and not (your know what) in his song "Gonna Dance All Night". Starting in the late '40s he recorded for Sun, Starday, Decca and lots of other labels and is still active today! You can purchase this issue securely online now OR you can order the digital version in PDF form e-mailed to you for $7.50! Click here for PDF please note which issue you're ordering with the payment! You'll see issue #45, but can order other 68 page issues from that same page (#35 - #56 - #56 is 60 pages).